When we moved to Ghana in 2011, I started doing some reading about Ghana. An article on economics mentioned something new to me. 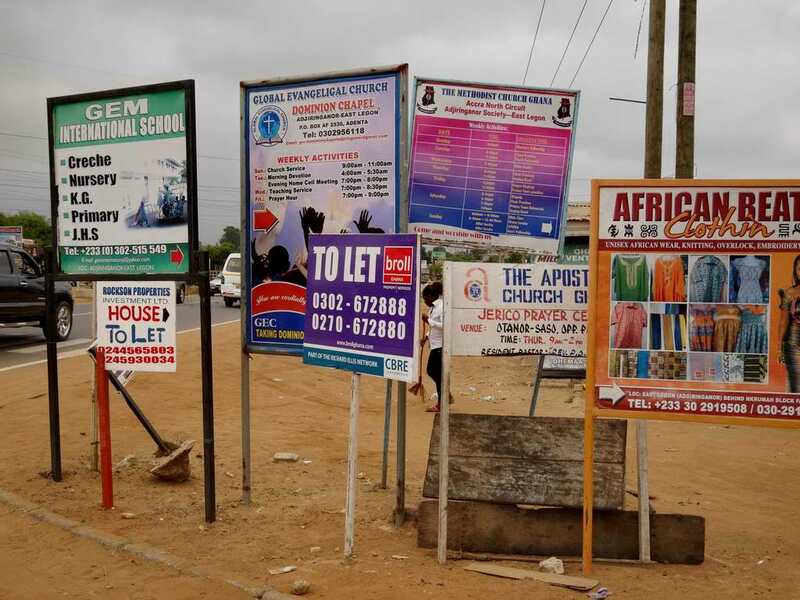 It said that and important next step in Ghana’s economic development should be the naming of streets and giving houses and businesses numbers on those streets. Being able to identify the physical location of a person, or where a vehicle or other piece of property is kept, turns out to be an important for business, banking, and credit. Before coming to Africa, I naively assumed that all places had street names and house numbers. In Burkina Faso, our first assignment, only a few main streets had names, I never saw numbers and I made my own map. 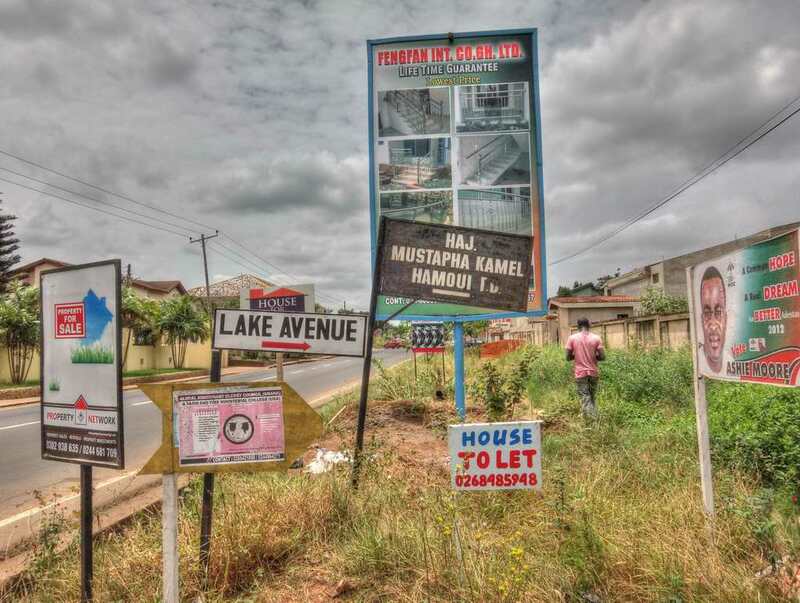 Ghana has more – some streets with names, some lots with numbers, and there are several maps of the city for sale. See an earlier blog – The Rock that God Put – for a story of how I found someone in a good-sized town when I only knew the part of town he lived in. Businesses and churches want to be found. So they have solved the problem of lacking street names. The solution? Many roads wear a lively garland of signs. Intersections host a swathe of them, each vying for your eye so that you will see that their business, church or whatever is just down this street, if only you would turn here. The need for signage is an economic opportunity. Sign painting businesses proliferate along with the welders who make the bare signs for the imaginative painters. The content of the signs is just plain fun. There is no other word for it. Not fun in the sense that they are to be made fun of, but fun in the sense that I don’t know what is coming next. Will it be the “Blessings come from God’s Great Covenant Beauty Salon?” Or perhaps the “Jehovah Lives Automatic Mechanic”, the “Out of Time Radiator Specialist” or the “Remember the Truth Photo and Video Studio”? I would love to have conversations with Ghanaian shop owners to find out how they chose the names for their shop, just like I did with a taxi driver to find out why he put Shame in his window. Enjoy the signs, I sure do. 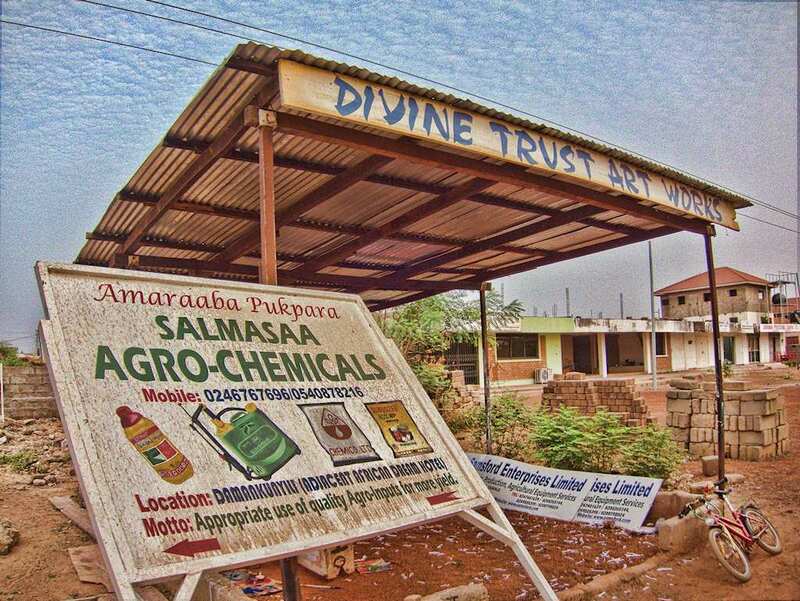 This entry was posted in Africa, Culture, Ghana, Signs and tagged accra, business names, sign painting, Signs, signs in Ghana, street address. Bookmark the permalink. Wow it reminds me of election times in the cities of the US – with all the signs for the politicians or for the propositions. We really enjoy these insightful nuggets. Thanks for keeping us updated so well.